All of our Malaysia itineraries are tailor-made for each individual client, according to their requirements and preferences. We do not sell pre-packaged trips of any kind. However, to show you how some of our trips can fit together, and the kind of holidays that previous clients have taken, we have laid out here a few examples. These are for example purposes only and should not be taken restrictively. Your trip can include a combination of any parts of these itineraries - the only limitations are your budget and your timeframe! Discover the very best of Malaysia in this 11-day luxury itinerary which includes Kuala Lumpur, Georgetown and Malacca, topped off with some relaxation on a beach. 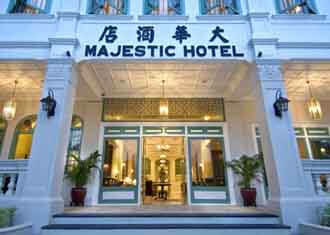 Built in 1932, The Majestic Hotel Kuala Lumpur has always been at the centre of Kuala Lumpur's social scene, and now after its complete refurbishment in December 2012, the hotel is taking centre stage as the prime hotel in Kuala Lumpur. You could describe the Cheong Fatt Tze Mansion as a living museum and you wouldn’t be far wrong, this Chinese courtyard style is one of the more unique properties in Georgetown but one well worth staying at. Filled with many original antiques, the rooms are all individually styled with wood finishings to personify the heritage of the hotel. If you cannot stay here then please attend one of the daily guided tours, they are fascinating. The Shangri La Rasa Sayang is the finest hotel on Batu Feringgi Beach. The rooms are very spacious and the only real difference is whether you are in the Garden Wing or the Rasa Wing, both are excellent and will allow you to return to paradise and relax in style.